The first largely-independent new route on Trango Tower in more than a decade has been completed by a four-man Russian team from the Moscow Mountaineering and Climbing Federation. Six climbers from the Federation arrived at base camp, with Dmitry Golovchenko, Sergey Nilov, team leader Viktor Volodin and Alexander Yurkin hoping to attempt a new line on the sunless and overhanging North Face. However, conditions meant the approach to the wall proved too dangerous, and instead the team opted for perhaps the least known facet of this famous 6,239m Karakoram spire, the North West Face opposite Trango Monk (5,850m). The 900m North West Face had one existing route, climbed in 1995 by the Basque trio of Antonio Aquerreta, Fermin Izco and Mikel Zabalza, and named Insumisioa (VI 6a A3+). Insumisioa is a term referring to draft dodging of the Spanish Military Service, which remained compulsory to the end of the 1990s. The three climbers were avoiding national service during their expedition. The Russians spent 10 days completing their new line, which follows a large corner system to the right of Insumisioa until joining it on a large sloping snow terrace at around three-fifths height. From here it appears to follow similar ground to Insumisioa to reach a smaller snow terrace at four-fifths height. Above this, it climbs left of Insumisioa to the summit. The four established three portaledge camps, the highest on the large sloping snow terrace. On the first two days they fixed five pitches, then took off capsule style for the top. The weather was good for the next five days, and relatively warm. Later it deteriorated and on the summit day was quite bad. The rock was reported to be relatively compact, with large corners and roofs in the lower and middle sections. Much of the climbing was aid and the route graded US VII A3 F6b+. The line has been named No Fear, the motto of a famous Moscow climbing club called Demchenko. All the team are members. In the meantime the other two members of the Russian expedition, Georgi Kozlov and Denis Saveliev, had climbed the relatively popular 1987 Slovenian Route on the South South East Face. It appears that the previously reported Russian repeat of the 1989 Spanish Route on the South Face actually stopped on the snow patches a couple of pitches below the summit. The pair had originally hoped to repeat the Original 1976 British Route, but found the upper section chocked with ice and therefore veered left to the drier Spanish line. 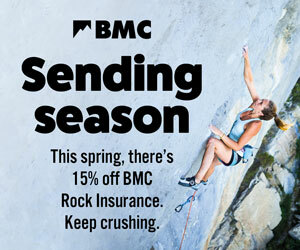 This line was original attempted in 1984 by a five-man British team that climbed 29 pitches in alpine-style and reached a point estimated to be one and a half pitches from easy ground before the weather broke. The Spanish completed the route five years later but in a much different style, making a prolonged and determined siege and fixing ropes on most of the route. The photo shows Trango Tower from the south west with the smaller Trango Monk to the left.